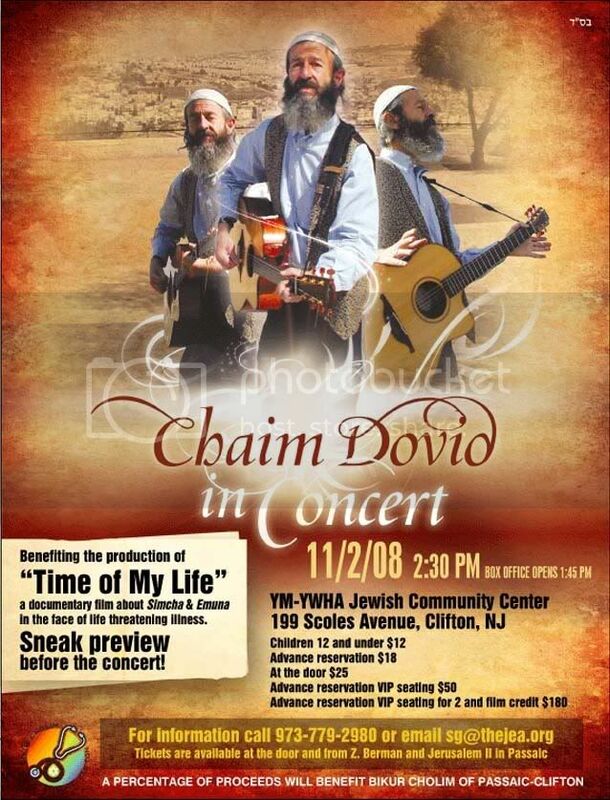 The transcendent Chaim Dovid will be performing this Sunday, November 2, at the YM-YWHA Jewish Community Center in Clifton, NJ to benefit the Bikur Cholim of Passaic-Clifton as well as to benefit the making of “Time of My Life.” The YM-YWHA JCC is located at 199 Scoles Avenue and Chaim Dovid will be taking the stage at 2:30 p.m. following a sneak preview of the documentary.For info. call 973-779-2980 or email sg@thejea.org. Tickets are available at the door and from Z. Berman and Jerusalem II in Passaic.